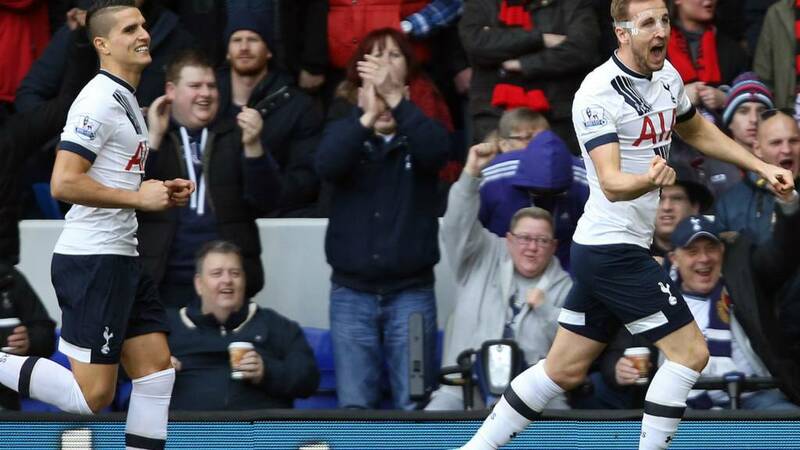 Second-placed Tottenham have moved to within five points of Premier League leaders Leicester. Read the match report of their routine win over Bournemouth here. Thanks for joining me this afternoon - enjoy the rest of your Sunday. A long-range shot over the bar from Tottenham's Christian Eriksen, and that should be just about that. Three minutes of added time to play. Spurs fans start a chant of "Leicester City, we're coming for you..." as Harry Kane flashes a shot wide of the post from 20 yards. Eric Dier will sit out the final couple of minutes, the midfielder being replaced by Nacer Chadli for the closing stages. Two last-ditch clearances by Bournemouth captain Simon Francis deny Tottenham a fourth goal. Ryan Mason's cross is blocked, before he toe-pokes Christian Eriksen's rasping drive away to safety. Tottenham substitute Ryan Mason is immediately into the action, his angled shot forcing a good stop from Bournemouth goalkeeper Artur Boruc. Dele Alli, eight yards out, the goal beckoning, plants his shot wide. Wonderful footwork from Christian Eriksen to set it up. It's his last action, as young midfielder Alli is replaced by Ryan Mason. Bournemouth threaten through Lewis Grabban but Toby Alderweireld stops his run and concedes a corner, which comes to nothing. Tottenham's two Premier League games after the upcoming international break are against Liverpool and Manchester United - who still lead Manchester City 1-0. Follow the closing stages of that game here. There's been a bit of a lull in this one, not surprising given Tottenham have had this game won since Christian Eriksen made it 3-0 on 52 minutes. It's just been one of those days for Bournemouth. Obviously it doesn't help when you concede in the first minute, but they've struggled to assert themselves in the game and had very little goalmouth action to speak of. They make their final substitution as Marc Pugh replaces Max Gradel. Tottenham make their first change as Tom Carroll replaces Erik Lamela. A worrying sight for Tottenham supporters as centre-back Kevin Wimmer goes down heavily under a challenge and grabs his left leg. He's back on soon enough, though, and Spurs are back up to 11 men. Tottenham's Dele Alli has had a quiet game by the exceptionally high standards he's set this season, yet he's set a goal up for Harry Kane and also run further than any other player on the field - 9.2km in the first hour. So, Spurs are on course to shrink that gap at the top of the table to five points. The question is - will Leicester ever slip up and give Tottenham a chance to pounce? Meanwhile, Bournemouth captain Simon Francis is booked for pulling down Harry Kane on the halfway line. Not content with two goals and an assist for Tottenham, Harry Kane is now making last-ditch tackles inside his own six-yard box. Bournemouth's Josh King denied. Well, that's that then. Tottenham have surely wrapped up the three points. Harry Kane tries a shot from 25 yards and it's palmed out by Artur Boruc - straight to the feet of an unmarked Christian Eriksen six yards out. Game over? Looks that way. Slightly better from Bournemouth. Substitute Lewis Grabban has had a couple of bright touches since coming on at half-time for the visitors. Still no shots on target for the Cherries, though. Bournemouth's bright start to the second half is ended by a swift Spurs counter attack. Harry Kane holds the ball up well and feeds the onrushing Kyle Walker, who fires an angled shot wide from 15 yards.